The Britannia oil and gas field is marked in rust colour stretching east west from Parliament to Cyrus. 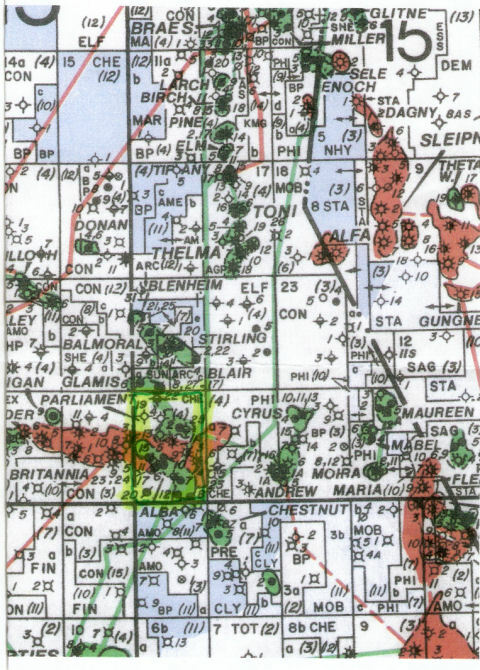 The alba oilfield is marked just below it on the eastern side. Even though there was no contract between myself and Chevron for the dowsing map survey - meaning I was not tied to any contract with anyone and I did not declare this information publicly until 2008. Outlay on Britannia Britain's largest new gas/condensate field development, could end up £500 million under the original target figure. Savings have come from a thorough review of the project at all levels, and through measures still being suggested by the numerous drilling and construction alliances. Drilling of a further 27 wells from the platform and subsea site did start in spring 1998, lasting at least until spring 2004. The 45 well total is considered necessary to fully deplete the reservoir over 30 years. The 900 ton subsea manifold, located 15km from the platform will also have three spare well slots. Recently Lonergan and Cartwright (1999) demonstrated how the narrow (ca.1.5km), elongate (ca. 12 km long) geometry and shape of the Eocene Alba Field in Block 16/26 of the Central North Sea has been significantly modified by polygonal faulting in the surrounding mudstones and by closely associated sandstone remobilisation. 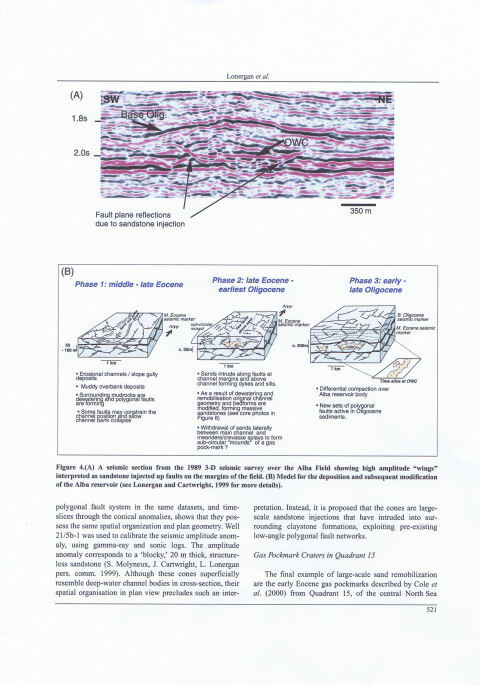 Polygonal faults are early, compaction related normal faults that form within layer bound stratigraphic units and are widespread throughout the deepwater Paleogene successions of the North Sea. Depositional processes are believed to have been responsible for the dominantly linear shape and channelised cross sectional geometry of the main reservoir. However, close observation shows that the current reservoir geometry is also influenced by the location of a network of polygonal faults in the surrounding basinal mudstones. Sheets of injected sandstone occur along faulted margins of the Alba Field ("wing" structures Fig. 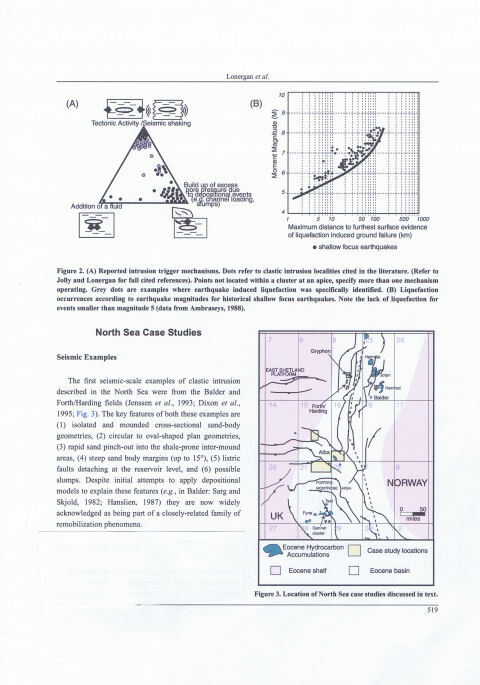 4A) and follow the trend of the polygonal fault system. 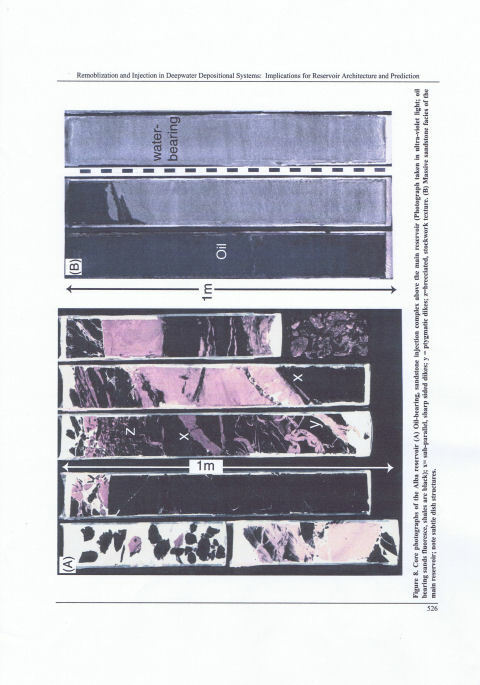 This indicates that polygonal faulting facilitated remobilisation and sand injection during early burial, which resulted in both modification of the primary reservoir geometry and redistribution of reservoir sands. The latter is illustrated by an overlying injection complex and by adjacent. mounded sand bodies. For example, isolated 1 km wide, sub-circular mounds to the west of the main field are attributed to sand withdrawal and remobilisation during early burial (Fig. 4B). Recently, Chevron and partners have acquired a new 3-D survey over the Alba field using four component ocean-bottom-cable technology which has enabled the top reservoir to be imaged seismically for the first time. These data highlight more examples of high amplitude "wing" structures along the reservoir margins and occasionally over the central axis of the field. Two recent wells have verified that the "wings" visible on seismic data are injected sands, with one of these injections comprising a 20 M thick sand layer. Core from the Alba field exhibits similar features to those found in Gryphon core. The cored interval in Figure 8A is an oil bearing, sandstone injection complex above the main reservoir unit. 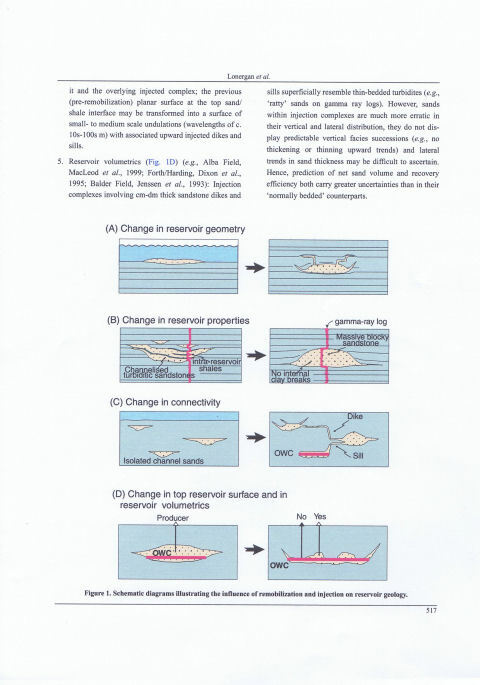 Note the sub-panelled, sharp top and bottom of dikes (x), ptygmatic folding indicating plasticity of the host sediments during instruction (y), and the stockwork of intimately associated angular clasts of host mud and intruded sand (z), indicating explosive brecciation during instruction. Despite the chaotic nature of the instrusive complex, the oil staining illustrates its connectivity with the main reservoir beneath. In contrast, Figure 8B illustrates a 3m cored section through the main Alba field reservoir. The homogeneity and lack of bedding structures within the sands is most striking; the only sedimentary structures visible are subtle dewatering related dish structures. This is one of the most typical reservoir facies encountered in the Late paleoene. Early Eocene reservoirs in the Central and Northern North Sea. With the data now obtained from drilling the Alba and Britannia oil fields. it is plain to see that using a map dowser to work on the seismics graphs alongside a senior geologist can prove beneficial for all parties. Click here to see Oil Company Testimonial. Chevron's fact sheet shows that my dowsing results were correct; there has proven to be a large oil field called Alba within the massive oil and gas field at Britannia. Click here to see Chevron Oil fact sheet. 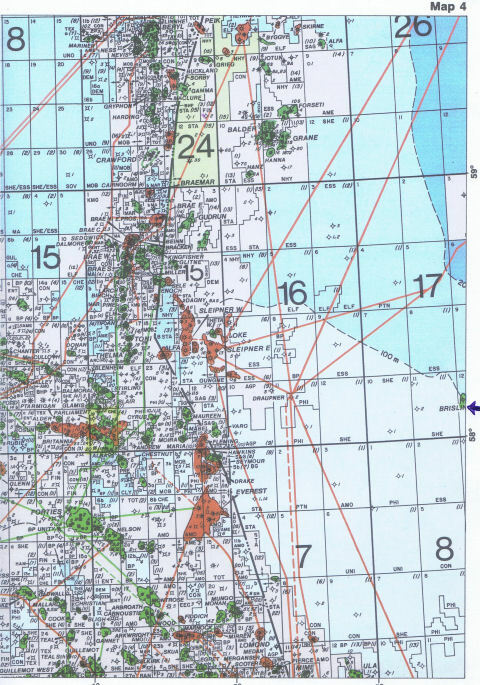 As you can see from the above fact sheet the Alba oil field is set to produce much more oil just as predicted by the map dowsing.